Photos from some of my travels - The resources you need to dramatically improve the bottom line of your company and the direction of your career. On my youngest daughter's first birthday I was in China. I made this sign and carried it with me across the globe so that while I missed her first birthday she would at least have some great photos when she was older. 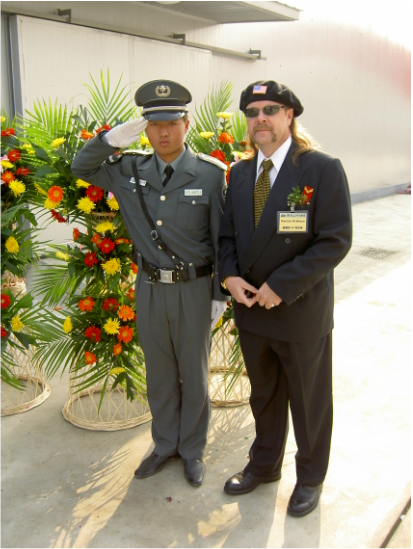 Yes that is me wearing an American flag Beret in China. I took the sign to a few other places also. The folks I traveled to China with stayed a bit away from me throughout the trip as I never took off my USA Flag beret once. I think some of them were very nervous. 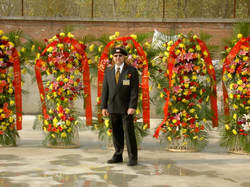 This trip was taken to celebrate the opening of a new factory in China for one of the companies I work with. I gave an opening ceremony speech. This was how I got up to the Great Wall. I think it was just as old as the Great Wall! I can't even guess the last time they did any maintenance on any part of this. I must confess standing on the Great Wall is an amazing experience. If you have some time one day read about when, why and how it was built. A side walk cafe. No joke. This is the infamous Hanoi Hilton where Senator John McCain was a prisoner for more than 5 years during the Vietnam war. Despite the propaganda put out the Hanoi Hilton was hell. It was so bad Senator McCain twice tried to kill himself. Scooters and motorcycles seem to be the primary mode of transportation. Yes that is what it is.